Do you like to play family guessing games too? Recently I was on the hunt for some more Creative Guessing Games For Kids, and stumbled across “Dohdles” by Thames & Kosmos. Long gone are the days when games simply involved players moving a marker around a board. Today’s games are more interactive and a lot more fun to play. 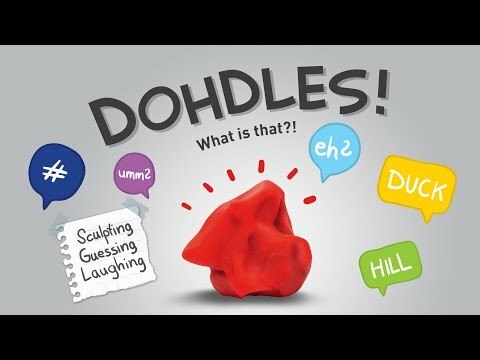 One of the fun games for families or as a party game is Dohdles made by Thames and Kosmos. Dohdles! What is that on Amazon?! These Dohdles are creations that are made by the players from dough. These creations are meant to be riddles to be solved but not solved too quickly. Each player gets to use his imagination to create a sculptor that has the other players guessing. The creations are often hilarious as each player who makes the creation interprets from his creative mind what he thinks it should look like. The shapes of the Dohdles can be something like an everyday object or like part of a body such as a nose. You don’t have to be an expert or artist to play. This kind of activities for kids enhances their imagination. The trick is to create your Dohdle as well as you can, but not make it so good that the other players all know right away what it’s supposed to be. For adults and children who have absolutely no creative sculpting talents at all, you’ll still be able to create items in certain shapes. This kids guessing game works by the players being able to figure out what their opponent has made with their sculptor. If you guess what it is, then you get points. But you also get points if the other opponents can’t all figure out what it was that you made with your sculpting clay. You want to make it so that some people can figure out what it is, but not everyone – because if everyone guesses what it was that you made, then you don’t get any points. But if no one guesses what you made, then you don’t get any points there either. The game is played with four rounds of the opponents trying to figure out what it is that you created. When it’s your turn to play, you’re allowed to question your opponents about what they created with their sculptor to help you figure out what it is. But you can’t ask open ended questions. These have to be questions that can be answered with either a yes or a no. You can also ask for a letter in the creation. When you’ve been given some of these clues, if you decide that you know what the opponent’s Dohdle is, you put your guessing cube into the funnel. Have a look what other parents say about “Dohdles” on Amazon. This funnel sorts the cubes and sends them out. The first cube out is the player who’s allowed to take the first guess. Anytime that you identify what your opponent created, you get to move forward. This is one of the fun guessing games for kids that can be played multiple times – because the clay doesn’t harden even after repeated use. You can be sure to have some great excitement around the table. P.S. Are you looking for a game that encourages language, spelling and reading? The Zip It game does just that.